Data is now recognized as one of the founding pillars of our economy, and the notion that the world grows exponentially richer in data every day is already yesterday’s news. Big Data doesn’t belong to a distant dystopian future; it’s a commodity and an intrinsic and iconic feature of our present — like dollars, concrete, automobiles and Helvetica. The ways we relate to data are evolving more rapidly than we realize, and our minds and bodies are naturally adapting to this new hybrid reality built of both physical and informational structures. And visual design — with its power to instantly reach out to places in our subconscious without the mediation of language, and with its inherent ability to convey large amounts of structured and unstructured information across cultures — is going to be even more central to this silent but inevitable revolution. Data visualization pioneers such as William Playfair, John Snow, Florence Nightingale and Charles Joseph Minard were the first to leverage and codify this potential in the 18th and 19th centuries, and modern advocates such as Edward Tufte, Ben Shneiderman, Jeffrey Heer and Alberto Cairo are among those responsible for the renaissance of the field over the last 20 years, supporting the transition of these principles to the world of Big Data. Thanks to this renewed interest, a first wave of data visualization took over the web and reached a broader audience outside the academic environments where it lived until then. But sadly, this wave was ridden by many in a superficial way, as a linguistic shortcut to compensate for the natural vertigo caused by the immeasurable nature of Big Data. “Cool” infographics promised us the key to master this untamable complexity and, when they inevitably failed to deliver on this overly optimistic expectation, we were left with gigabytes of unreadable 3D pie charts and cheap translucent user interfaces full of widgets that even Tony Stark or Minority Report’s detective John Anderton would have a hard time making sense of. In fact, visual design is often applied to data simply as a cosmetic retouch of important and complicated issues in an attempt to make them look simpler than they are. What made cheap marketing infographics so popular is probably their biggest contradiction: the false claim that a couple of pictograms and a few big numbers have the innate power to “simplify complexity.” The phenomena that rule our world are by definition complex, multifaceted and mostly difficult to grasp, so why would anyone want to dumb them down to make crucial decisions or deliver important messages? 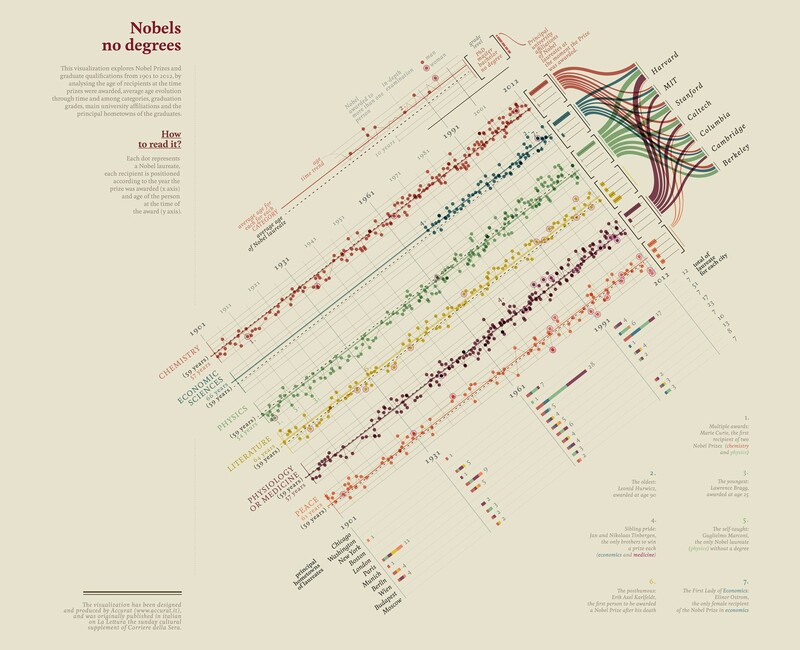 But not all is bad in this sudden craze for data visualization. Not only are we now realizing that there is still a substantial distance between the real potential that lies hidden in vast pools of data and the superficial imagery we often use to represent them, but most importantly, we realize that the first wave was successful in making others more familiar with new terms and visual languages. Now that we are past what we can call peak infographics, we are left with a general audience that understands some of the tools needed to welcome a second wave of more meaningful and thoughtful visualization. We are ready to question the impersonality of a merely technical approach to data, and to begin designing ways to connect numbers to what they really stand for: knowledge, behaviors, people. Data represents real life. It is a snapshot of the world in the same way that a picture catches a small moment in time. Numbers are always placeholders for something else, a way to capture a point of view — but sometimes this can get lost. Failing to represent these limitations and nuances and blindly putting numbers in a chart is like reviewing a movie by analyzing the chemical properties of the cellulose on which the images were recorded. In its second wave, data visualization will inevitably be all about personalization. The more ubiquitous data becomes, the more we need to experiment with how to make it unique, contextual, intimate. The way we visualize it is crucial because it is the key to translating numbers into concepts we can relate to. Accurat for Corriere Della Sera. 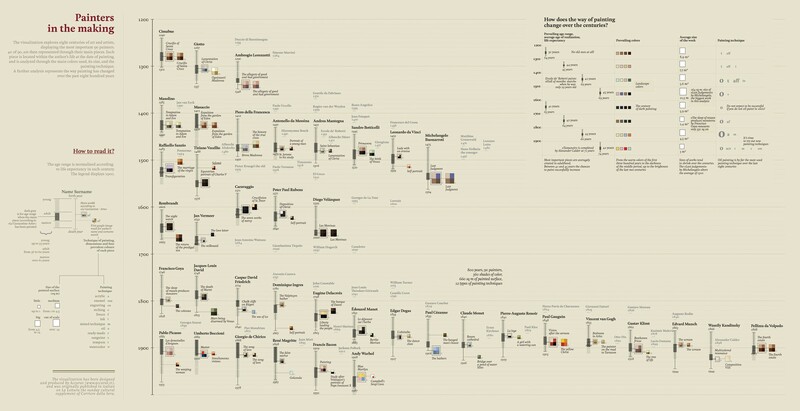 Series of exploratory, dense, data-driven narratives published in La Lettura, the Sunday cultural supplement. Complexity is an inherent feature of our existence — the world is rich in information that can be combined in endless ways. Creating new points of view or uncovering something new typically cannot happen at a mere glance; this process of revelation often needs and requires an in-depth investigation of the context. Whenever the main purpose of data visualization is to open people’s eyes to fresh knowledge, it is impractical to avoid a certain level of visual complexity. In a collaboration that lasted more than two years with the newsroom of Italy’s largest newspaper, Corriere Della Sera, my design company, Accurat, had the opportunity to work on a series of experimental data visualizations for their Sunday cultural supplement. 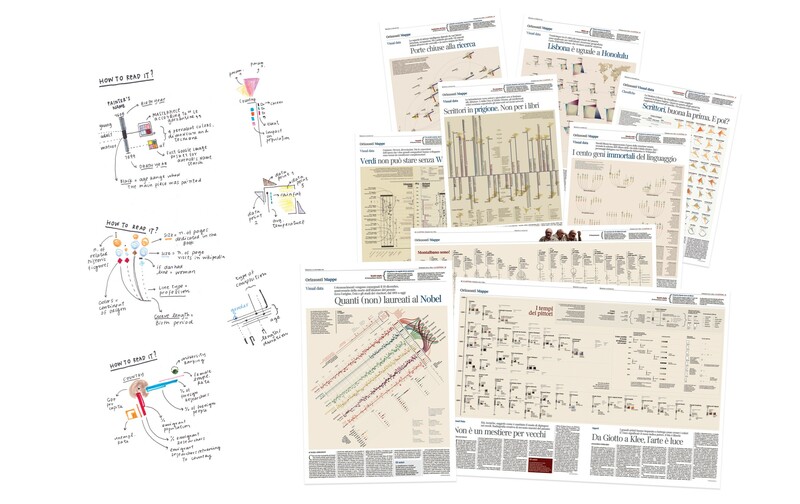 Our role was to conceive visual narratives, based on data, that achieved the same thoughtfulness and depth of the other essays published in the supplement — pushing the boundaries of what visualization can do with high-density data rife with multiple attributes. The Future, as Foretold in the Past, Accurat for La Lettura. 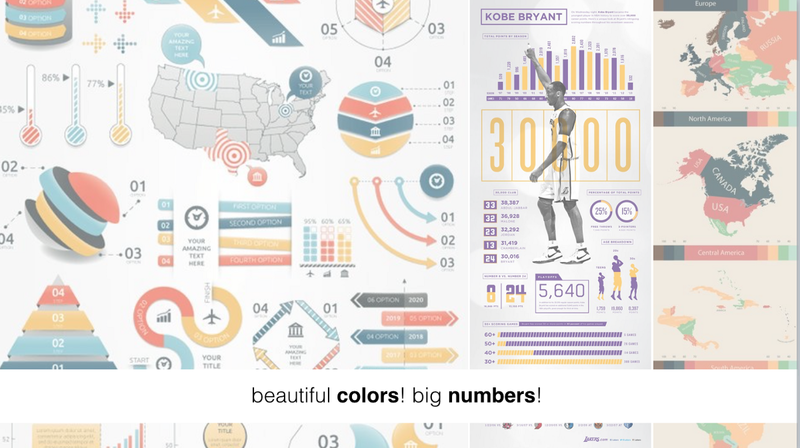 Each week, we chose an interesting topic to explore, and we searched for multiple data sources, both quantitative and qualitative, that we then combined into a single elaborate visual narrative. The goal was to move away from a simple measurement of quantity; we transformed raw information into interconnected knowledge, presenting unexpected parallels and secondary tales to supplement the main story. Since clarity does not need to come all at once, we layered multiple visual narratives over a main construct that served as the jumping-in point for readers to begin and follow their interest. We call this process nonlinear storytelling; people can get happily lost exploring individual elements, minor tales and larger trends within the greater visualization, while being naturally invited to engage with the visual on deeper levels. 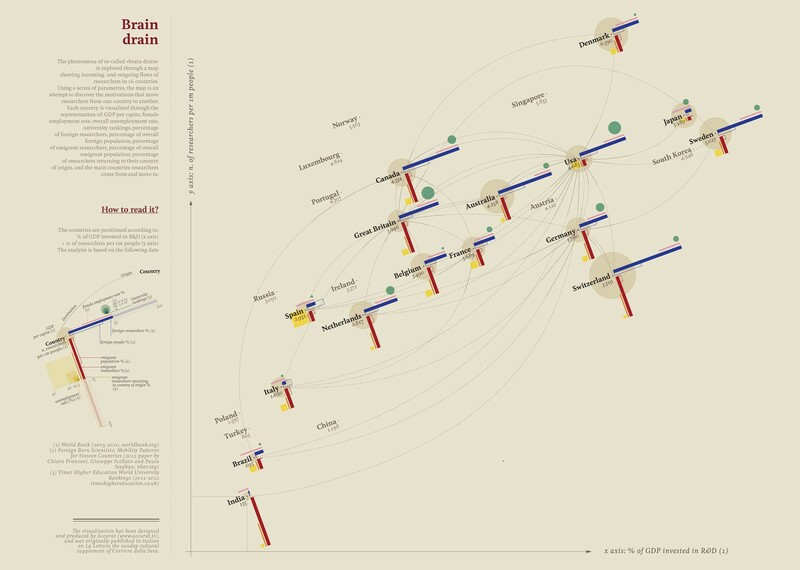 Dense and unconventional data visualizations promote slowness — a particularly poignant goal to set in our era of ever- shortening attention spans. If we can create visuals that encourage careful reading and personal engagement, people will find more and more real value in data and in what it represents. One size does not fit all. Business intelligence tools and dataviz tools for marketers have led many to believe that the ideal way to make sense of information is to load data into a tool, pick from among a list of suggested out-of-the-box charts, and get the job done in a couple of clicks. This common approach is actually nothing more than blindly throwing technology at the problem, sometimes without spending enough time framing the question that triggered the exploration in the first place. This often leads to results that are not only practically useless, but also deeply wrong, because prepackaged solutions are rarely able to frame problems that are difficult to define, let alone solve. Thoughtful design comes to the rescue again. What I always do when I start a new data project is to move away from the screen and start drawing. I draw with data in my mind, but with no data in my pen: I sketch with data to understand what is contained in the numbers and in their structure, and how to define and organize those quantities in a visual way to create opportunities to gain insight. Sketching with data — so, in a way, removing technology from the equation before bringing it back to finalize the design with digital tools — introduces novel ways of thinking, and leads to designs that are uniquely customized for the specific type of data problems we are working with. I draw to freely explore possibilities. I draw to visually understand what I am thinking, I draw to evaluate my ideas and intuitions by seeing them com- ing to life on paper, I draw to help my mind thinking without limitations, without boundaries. To expand their data-drawing vocabulary, designers can access hundreds of years of visual information encoding — the evolution of music notation from medieval times to contemporary music, the experimentation with geometric shapes that characterized Avant-Garde artists of the last century. These visual languages, while clearly pursuing different goals, have a lot in common with data visualization: they draw on common perception principles and use simple shapes, select symbols and a definite range of colors to create basic visual compositions that deliver a message and please the eye. A dataset might lead to many stories. Data is a tool that filters reality in a highly subjective way, and from quantity, we can get closer to quality. Data, with its unique power to abstract the world, can help us understand it according to relevant factors. How a dataset is collected and the information included — and omitted — directly determines the course of its life. Especially if combined, data can reveal much more than originally intended. As semiologists have theorized for centuries, language is only a part of the communication process — context is equally important. This is why we have to reclaim a personal approach to how data is captured, analyzed and displayed, proving that subjectivity and context play a big role in understanding even big events and social changes — especially when data is about people. 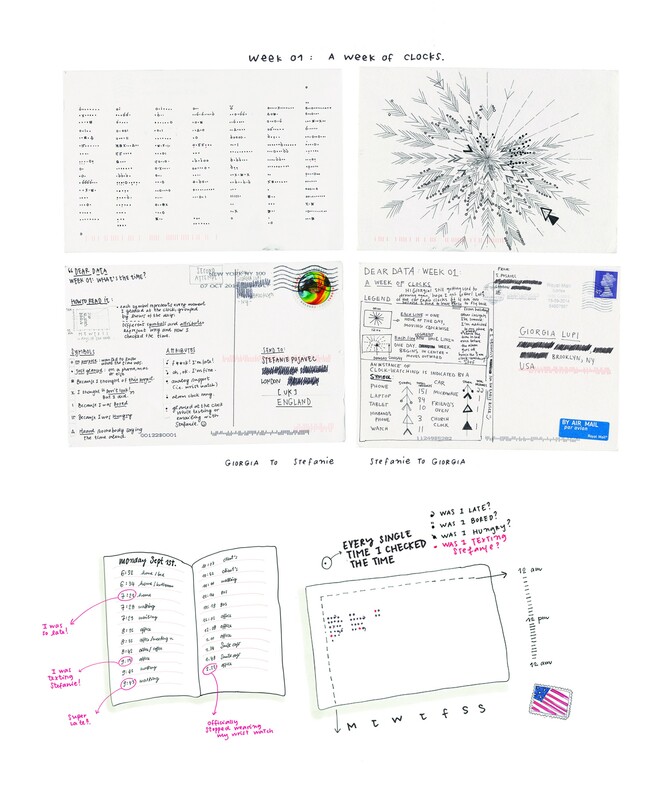 To research this realm, I undertook a laborious personal project: a yearlong hand-drawn data correspondence with information designer Stefanie Posavec. We have numerous personal and work similarities — I am Italian and live in New York, and she is American and lives in London. We are the exact same age, and we are only-children living far away from our families. Most importantly, we both work with data in a very handcrafted way, trying to add a human touch to the world of computing and algorithms, using drawing instead of coding as our form of expression. And despite having met only twice in person, we embarked upon what we called Dear Data. For a year, beginning Sept. 1, 2014, Posavec and I collected our personal data around a shared topic — from how many times we complained in a week, to how frequently we chuckled; from our obsessions and habits as they showed up, to interactions with our friends and partners. At the end of the week we analyzed our information and hand-drew our data on a postcard-sized sheet of paper, creating analog correspondence we sent to each other across the Atlantic. It was a slow, small and incredibly analog transmission, which through 52 pretexts in the form of data revealed an aspect of ourselves and our lives to the other person every week. We spent a year collecting our data manually instead of relying on a self-tracking digital app, add- ing contextual details to our logs and thus making them truly personal, about us and us alone. For the first seven days of Dear Data we chose a seemingly cold and impersonal topic: how many times we checked the time in a week. 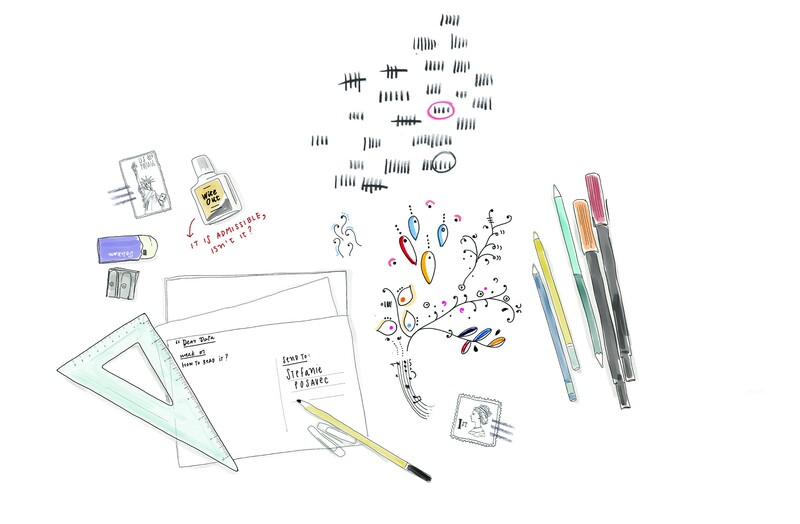 On the front of my postcard, (as shown above) every little symbol represents all of the times I checked the time, ordered per day and hour chronologically — nothing complicated. But the different variations of my symbols on the legend indicate anecdotal details that describe these moments: Why was I checking the time? What was I doing? Was I bored, hungry or late? Did I check it on purpose, or just casually glance at the clock while occupied in another activity? Cumulatively, this gave Posavec an idea of my daily life through the excuse of my data collection — something that’s not possible if meaning isn’t included in the tracking. 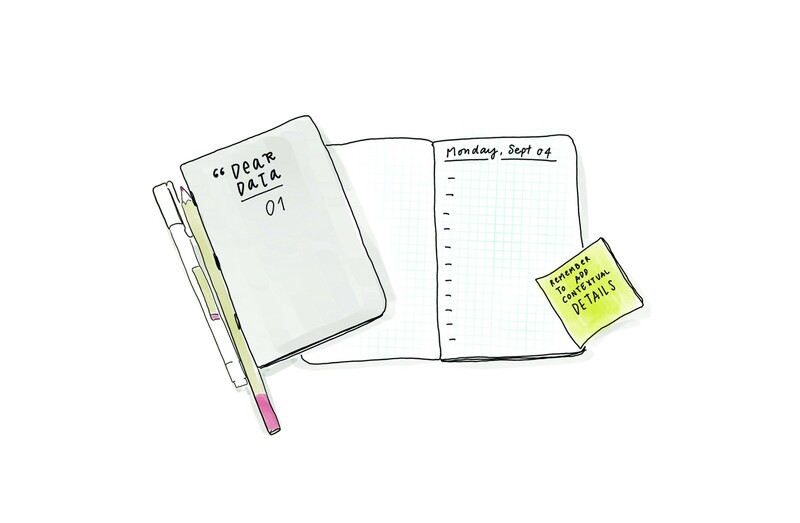 As the weeks moved on, we shared everything about ourselves through our data: our envies, the sounds of our surroundings, our private moments and our eating habits. We truly became friends through this manual transmission. And in fact, removing technology from the equation triggered us to find different ways to look at data — as excuses to reveal something about ourselves, expanding beyond any singular log, adding depth and personality to quantitative bits of information. In a time when self-tracking apps are proliferating, and when the amount of personal data we collect about ourselves is increasing all the time, we should actively add personal and contextual meaning to our tracking. We shouldn’t expect an app to tell us something about ourselves without any active effort on our part; we have to actively engage in making sense of our own data in order to interpret those numbers according to our personal story, behaviors and routine. While not everyone can do a project as hyper-personal as this one, data visualization designers can make their interpretations more personal by spending time with any type of data. This is the only way we can unlock its profound nature and shed light on its real meaning. Let’s just stop thinking data is perfect. It’s not. 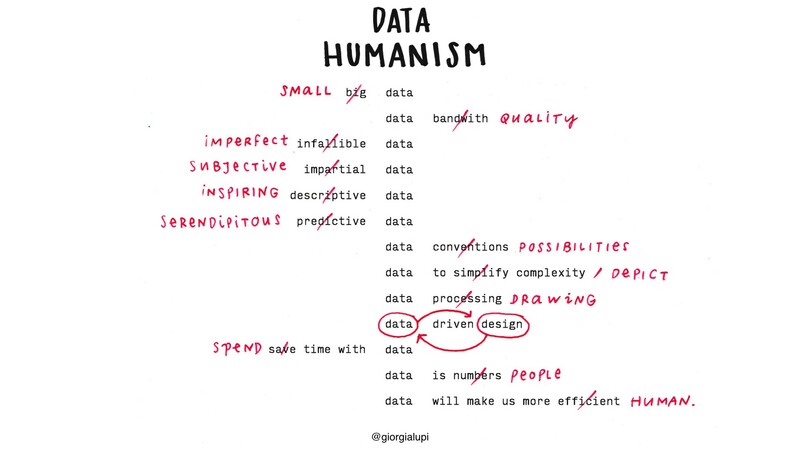 Data is primarily human-made. “Data-driven” doesn’t mean “unmistakably true,” and it never did. It’s time to leave behind any presumption of absolute control and universal truth and embrace an informed depiction of the big numbers and small imperfections that work together to describe reality. And data visualization should embrace imperfection and approximation, allowing us to envision ways to use data to feel more empathic, to connect with ourselves and others at a deeper level. The more effort we put into researching and translating, the easier the reader will understand and relate to the stories we tell. But this requires a paradigm shift in the way we represent information visually. We should learn how to include and render the more qualitative and nuanced aspects of data. We should experiment with how to visualize uncertainty, possible errors and imperfections in our data. And most importantly, we should keep in mind how data can be a powerful tool for all designers, bringing stories to life in a visual way and adding structural meaning to our projects. 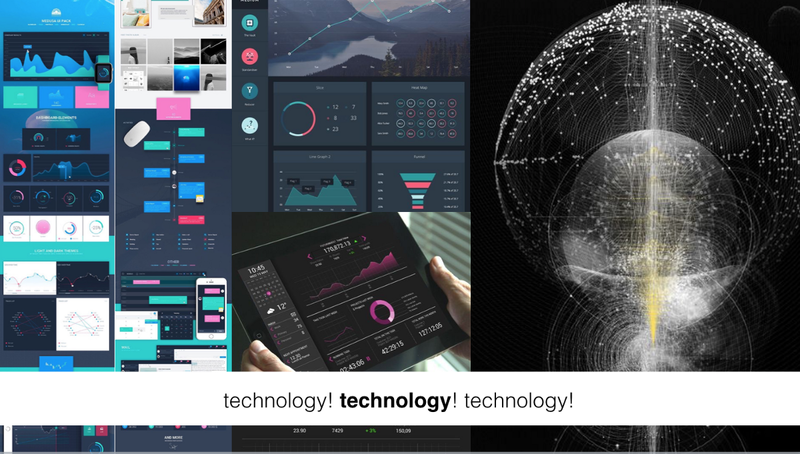 It is an uncommonly exciting time to be a data visualization designer; projects and opportunities are more and more complex and challenging, and the field is growing and becoming even more popular. We have to find new languages, and explore how to convey knowledge and inspire feelings simultaneously with data. We have to explore how to be faithful to scientific accuracy while allowing space for exceptions to flourish. We have to bring data to life — human life. I believe we’re primed for the future. Let’s get started. Giorgia Lupi is an award-winning information designer. She co-founded Accurat, a data-driven design firm with offices in Milan and New York, where she is the design director. She received her M-Arch at FAF in Ferrara, Italy, and earned a Ph.D in design at Politecnico di Milano, and now lives in New York City. She is co-author of Dear Data (Princeton Architectural Press, September 2016).The Original Collection of the Dear Data postcards has recently been acquired as part of the permanent collection of the Museum of Modern Art.